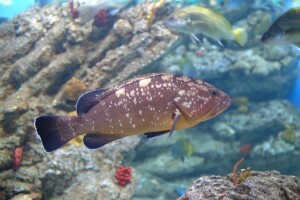 The dusky grouper is a fish with a very robust body, a large head and round eyes. It has a large mouth and the lower jaw sticks out a little. 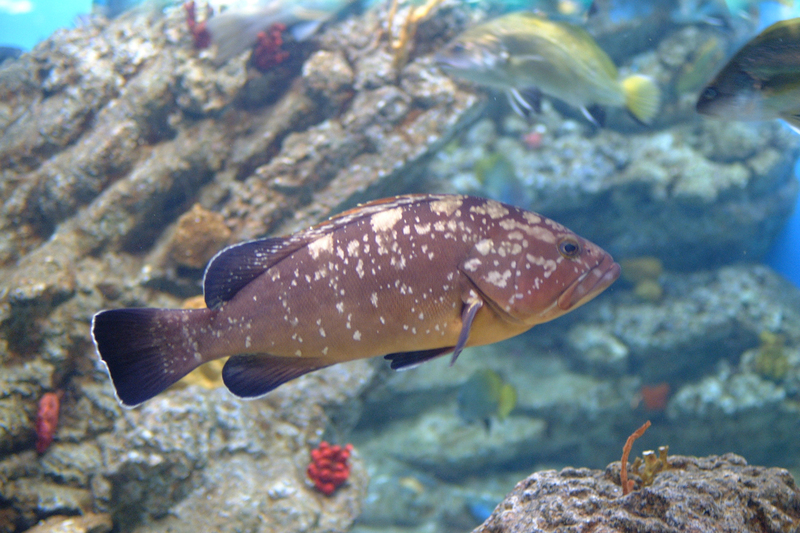 The grouper’s teeth are cone-shaped, and although they are small, they are very strong. The tail is round with very powerful muscles. The grouper’s colouring is very curious. It is a dark brown fish with a body covered in light white or yellow stains. Its belly is lighter and the fin fringe is white. If you look at a dusky grouper you see that the stains on its body are gathered to form vertical stripes, whereas on the head, they are close to the eye and seem like tears running down its face. Its maximum size is 1.5 m.
Dusky groupers are normally solitary and have well-marked territories, with shelters in the form of a cavity. They are perfect guardians and as they are not very good swimmers they spend most of their time immobile in front of their hole, where they hide in the event of threat. This is a carnivorous animal that feeds on cephalopods such as octopus and squid, crustaceans and it can also hunt other fish. It is an oviparous hermaphrodite. In times of spawning, in the summer, it is possible to see a large animal, the male, along with one or several smaller animals, the females. It is a common animal between 10 and 400 m in depth. It lives among the rocks with abundant holes and caves. It is found in the Mediterranean, sometimes in the eastern Atlantic and rarely in the Bay of Biscay. It can live for up to 40-50 years. The position of the eyes so far forward helps it to see when it is hidden in the caves.